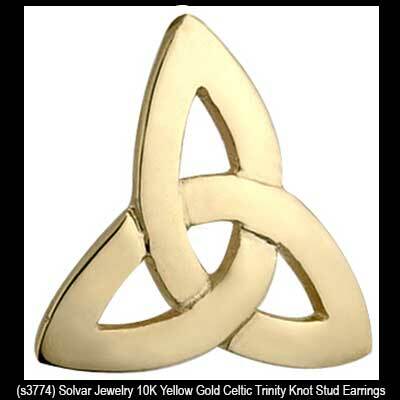 Celtic earrings are gold studs that feature interlaced Trinity knots and hearts, forming a love knot. 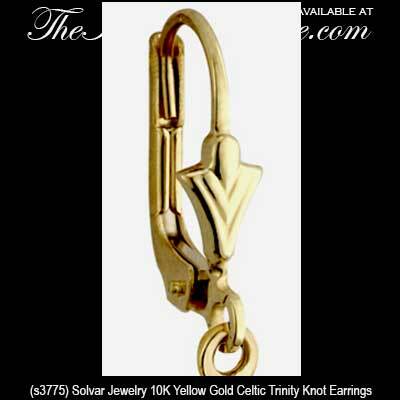 Celtic earrings are 10K gold studs that are enhanced with Trinity knots inside of squares. 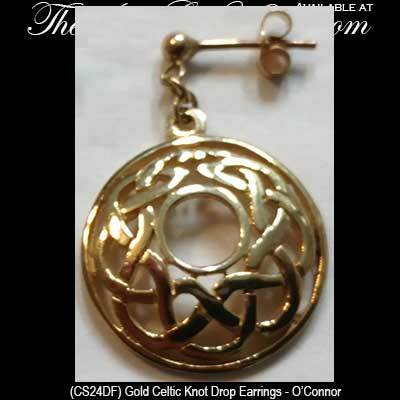 Celtic knot earrings feature a 9K gold dangle design that is inspired by the Book of Kells. These 14K gold Celtic earrings are white gold accented love knots with combined Trinity knots and hearts. Sorry, these Celtic love knot earrings are now sold out. 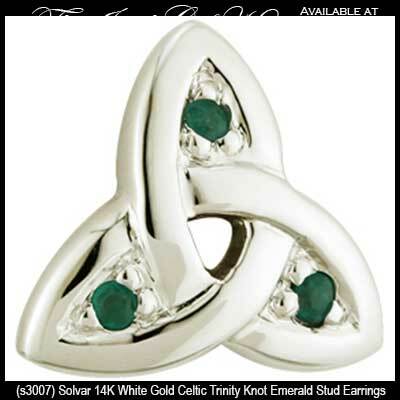 Celtic stud earrings are small white gold Trinity knots with diamonds. Sorry, this Celtic earrings now sold out. Diamond stud Celtic earrings are crafted in 14K gold and feature white gold enhanced Trinity knots. Sorry, but these Trinity earrings are sold out. We hope that you enjoyed browsing our selections of gold Celtic earrings and trust that you found the perfect pair. You may now wish to compliment your selection with a matching gold Celtic necklace or a Celtic bracelet from our vast selections. Additional considerations in creating your ensemble may be a piece of History of Ireland jewelry or a Tree of Life necklace that is enhanced with Trinity knots. Our Celtic brooches are often overlooked but they can prove to be very adaptable as either a wardrobe accent or as a focal point and a Celtic ring on your finger is always in good taste. If you appreciate a wider and more substantial piece of jewelry on your finger, you are in luck, as The Irish Gift House has a superb assortment of designs that include Trinity wedding bands and Celtic knot wedding bands along with the ever popular sterling silver Celtic wedding bands. As always, if you can't find the perfect piece of Irish jewelry, just give Kerry and Andrew a call at 877-474-7444. We are always happy to be of service.